Motion sickness is caused by disorientation. When you are still and seated in a vehicle, but you can see and hear the world whizzing by, a confused signal is sent to your brain. The inner ear knows that you’re moving, yet you are motionless. The result is sweating, nausea, and vomiting. Though it seems like a trick of the mind, it is very real and quite unpleasant. 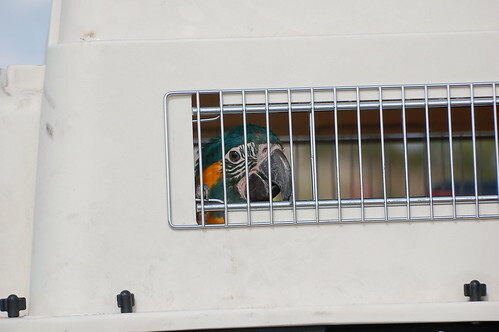 Parrots, like people, can be affected during travel. There really aren’t any rules regarding motion sickness. Some are affected by it, others aren’t. Some eventually get sick during a long drive, while others feel the effects almost immediately. Before you take a long, possibly uncomfortable trip with your parrot, it is advisable that you take shorter ones with her to see how she reacts to riding in the car. Start with quick 15 minute trips and build up the duration to help increase her tolerance to travel. You might be well into an out of state trip before she begins to get sick. Other stomach remedies are basil and peppermint. If your parrot doesn’t care for ginger these are good alternatives. You can prepare them in the same way using the leaves of the plants. Some parrots seem to do better with motion sickness if they are left covered. Perhaps NOT seeing the world whizzing by keeps the disorientation at bay. Observe whether a partially or fully covered cage works best for your bird. The best way to handle this problem, once you determine there is one, is to experiment to see what makes your bird the most comfortable with travel. As always, planning ahead of time will save you a lot of worry and help your parrot to feel better during a trip.